The Flexiwing Delta Kite is designed for fishing 5 to 12 hooks from a fishing rod or beach reel. 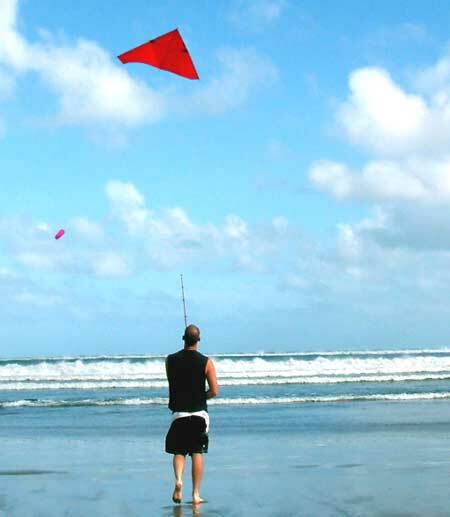 This kite provides constant pull over a wide wind range due to rubber bands on the spreader spar. The bands stretch under load and reduce the wingspan and pull of the kite. Excess wind is spilled in gusts. This feature allows the kite to be comfortably retrieved from either a large capacity boat reel (e.g. Penn Senator 6/0 or 9/0 range) or from a Paul's Fishing Kites Beach Reel. 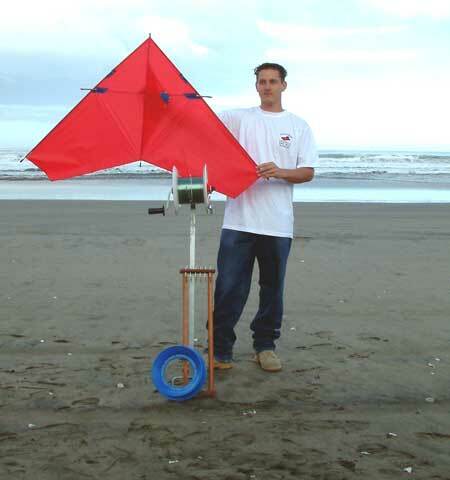 The Flexiwing is a delta kite and is manufactured from top quality materials. The entire frame is constructed from hollow carbon fibre tube to ensure the lightest most rigid kite possible. The kite skin is made from lightweight sail cloth. The Flexiwing Kite is ideal for those who enjoy kitefishing solo. The ideal kiteline and mainline for the Flexiwing Kite is 50lb to 80lb breaking strain spectra superbraid, although it will perform well on 50lb nylon. Spectra is one third thinner and lighter than the equivalent nylon fishing line. This means the line can be supported by the kite much further offshore plus the kite has less load to pull. In Hawaii this kite is popular for targeting mahi mahi, giant trevally, yellowfin tuna and sailfish from cliff tops and rocky ledges. In New Zealand most fishers use the flexiwing for catching snapper kahawai and gurnard. The Flexiwing Kite is great for sportfishing, targeting gamefish and excels at powering 5 to 10 hook dropper rigs. Note : Reel, mainline, handspool and trace rack are not included.